I just arrived in Sri Lanka, the second stop on my latest round-the-world tour, after a fantastic flight on Cathay Pacific’s new Airbus A350, followed by an exciting “solo” flight on one of the airline’s A330s, in which I had the rear business-class cabin all to myself. But my goal is really getting to Brussels — and if you get a little creative with flight bookings, you can do what I did and end up saving a substantial amount on a premium-class flight, by routing through the Sri Lankan capital Colombo. 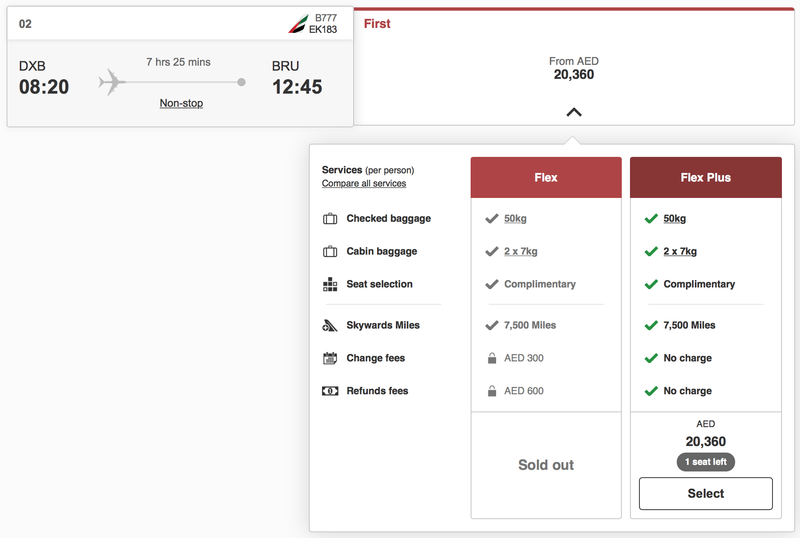 This time around I am reviewing Emirates’ brand-new first-class suite on Friday’s inaugural flight from Dubai (DXB) to Brussels (BRU). My apparently incongruous presence on an island in South Asia, then, has to do with the way airlines calculate fares — specifically how low they tend to price flights originating in a few select markets, including Colombo (CMB). Essentially, TPG is saving thousands of dollars on my Emirates ticket by having me begin the itinerary here. So that’s why I traveled all the way to Sri Lanka, for one night, followed by a flight in Emirates’ “old” first-class suite to Dubai and then finally the main event. If I were to book just the segment I need, Emirates Flight 183, it would run me $5,500 one-way. Originating in Colombo cost me instead about $3,000, including the first-class flight from Colombo to Dubai. (I certainly won’t object to an extra four hours in Emirates first class, followed by seven hours in the airline’s gigantic first-class lounge in Dubai.) When all is said and done, I’ll be flying an extra 5,760 miles to save about $2,500 — a great deal on the surface. The catch is that I am based in New York, and I needed to make my way to Colombo first, which is easier said than done. To get there cheap, I could have flown for example in business class on Kuwait Airways for about $1,700, or economy for less than $500. But we wanted to get an interesting review out of the extra time spent away from home, so I ended up booking business class on Cathay Pacific’s latest Airbus A350, from Newark to Hong Kong, and on to Colombo. That ticket cost $4,600. We were hoping award space would open up at the last minute, but it never did. So, in order to make the most of our time, we decided to spend a bit more to get a review we really wanted to have. However, that necessity doesn’t apply to most readers, who can save a bundle with a routing through Colombo. You can do far better by booking a round-trip flight originating at CMB. 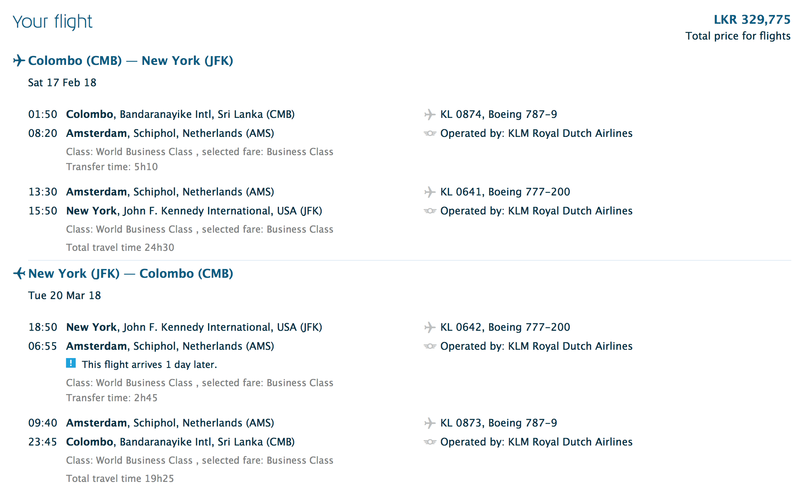 For example, I’m seeing fares from Colombo to New York for $2,147 in KLM business class, including flights on the airline’s new Boeing 787 Dreamliner. Booking just Amsterdam to New York on the same dates will run you more than twice that amount. Originate in Colombo to fly KLM’s Dreamliner on the cheap. But why would you want to fly round-trip from Colombo if you live in the US? Well, you probably wouldn’t. But CMB is just an hour-long flight from the Maldives — use miles to get to Male (MLE), spend a few days at the fantastic St. Regis and then book a one-way flight to CMB for as little as $99. You can catch your KLM Dreamliner to Amsterdam and on to New York, then save the return for a future trip to Europe — assuming you aren’t checking bags, you could fly the segment from New York back to Amsterdam and skip the longer leg back to Colombo. In the end, you’d be flying in comfort from (a city near) the Maldives, and you wouldn’t have to deal with racking up the necessary miles or trying to land hit-or-miss business-class award space. Plus, Sri Lanka is entirely worth a visit as well, and you’d be getting a lie-flat flight back to Europe. In the end, is saving a couple grand worth all the extra flying and effort? If you’re able to build an extended trip around it, I’d say absolutely. I have to admit that I’m exhausted at this point, but assuming all goes to plan, I won’t have any regrets. I’ve booked premium-cabin flights from Colombo in the past — back in June to fly Qatar’s Qsuite — and I’m sure I’ll be doing it again.